2019 marks our 'coming of age' 21st year. 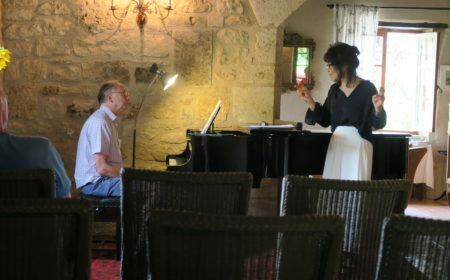 Lot Music is a summer course for pianists which takes place in the very picturesque Lot Valley. 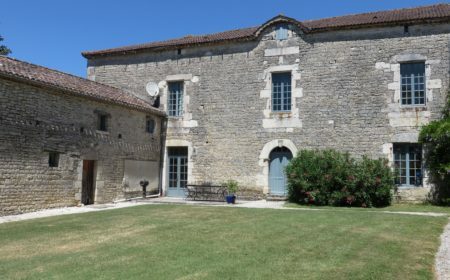 It is aimed at those who would like to join a group with a common musical interest in a convivial relaxed atmosphere in South West France with all it has to offer. The ethos is to create an ambiance where pianists approximately ABRSM grade VIII upwards can feel relaxed and inspired to play the piano. Particularly it gives a unique opportunity for amateur pianists to play to others and to have tuition from very high profile tutors. 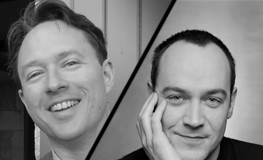 Pianists' partners are welcomed and there are a few spaces for non playing observers. In 2014 we moved to a stunning new venue Hostellerie Le Vert a family run 7 bedroom hotel which we have for our exclusive use. The course includes full board with superb food from Eva and Bernard's kitchen made with fresh seasonal produce which is mostly locally sourced and organic. One's own transport/carhire is strongly recommended as it is a rural location and some accommodation necessarily is off site. The Lot Valley is a lovely area to explore with walks and cycle routes from the door step or simply relax by the beautiful swimming pool. The tutors offer inspiration & confidence to those less familiar with playing to others, as well as responding to the needs of the advanced players. Very advanced players can be offered a platform to give one of the evening recitals. 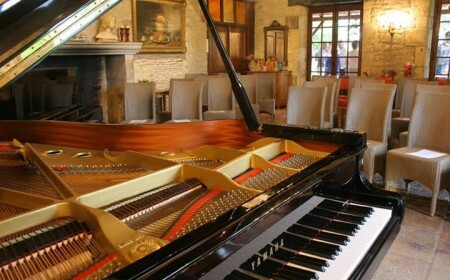 The course is for a maximum of nine pianists in order to give each person individual attention. 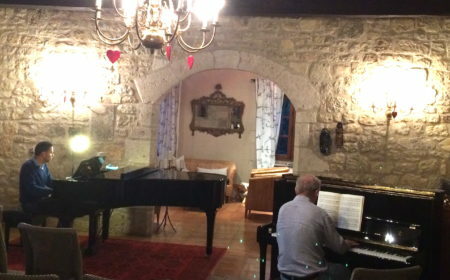 The course is perhaps unique in welcoming the pianists’ partners. 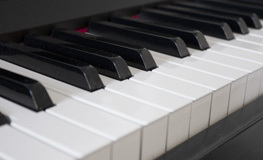 It is aimed at adult pianists and would suit piano teachers, amateurs, or anyone with a passion for playing the piano. The choice of repertoire is free. In the teaching room there are two pianos allowing for concerto or two piano works. The course runs for one week with all tuition in masterclasses. Continental breakfast followed by morning masterclass (Yamaha C5 grand piano). Each participant can expect two hours of playing to the class (divided into three sessions) during the week. Non-playing partners have use of the pool and opportunities for exploring the region, etc. Alfreso lunch: prepared in house. Free for practice (use of four pianos and a clavinova) allowing up to two hours practice time per person per day. Other activities include swimming, walking, exploring the area, canoeing, wine tasting, or just soaking up the atmosphere. We rendevous for drinks on the terrace followed by an early evening recital by the tutor or advanced participants on most evenings. There is a participants’ concert on the last evening. 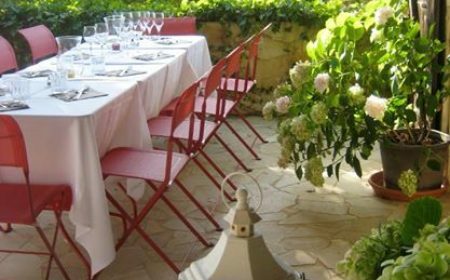 Dinner is taken at Le Vert apart for one or two evenings where we will go out to local restaurants. 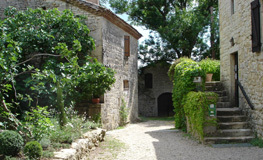 The cuisine is regional French and South West France is especially famous for fois gras, confit of duck, pork, truffles, walnuts and, of course, Cahors wines. From Bernard’s highly acclaimed kitchen there will be wonderful menus made with seasonal local produce and an exciting variation throughout the week. Vegetarians are also catered for. Course ends: After breakfast on last day. Course fees include full board, all restaurants, wine with dinner, masterclass tuition and concerts. TRAVEL IS NOT INCLUDED. Transport to restaurants depends on the goodwill of participants with cars to give others lifts, or taxis can be arranged at a supplement. We are exceptionally lucky and a big thank you to Eva and Bernard Philippe and family for agreeing to host Lot Music at their lovely hotel. 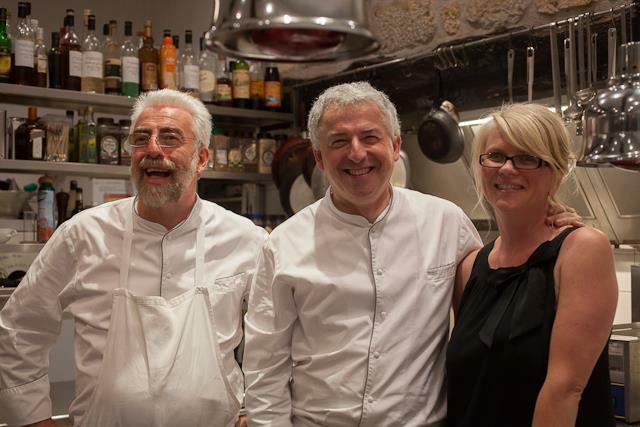 Bernard is a great chef and their restaurant has earned many accolades. Please see the venues page for further information and a link to their website. 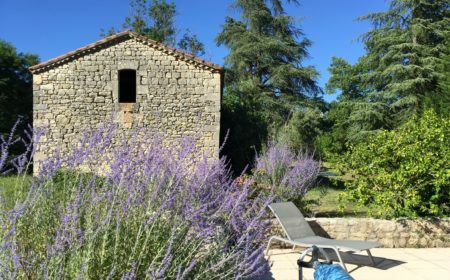 It is situated in a lovely part of the Lot Valley in a beautiful setting close to Puy L’Eveque, Tournan D’Agenais and Prayssac. There are seven en suite bedrooms available for single occupancy. The restaurant will become our recital and teaching room. Meals will be taken on the terrace weather permitting. 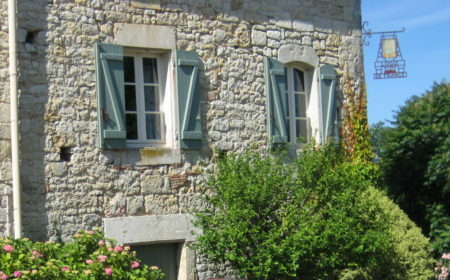 There is a swimming pool, a lovely large terrace and plenty of garden to relax in. Additional accommodation is at Le Canel (four ensuite rooms available for single occupancy) where there is also a large elegant sitting room. Breakfast will be provided. One practice piano will be situated here and a clavinova. (La Tour and L’Ecurie) and more information can be found on the venues page.